Four-hundred-year-old paintings hung high inside Notre-Dame were damaged by the immense fire that engulfed the Paris cathedral, but emergency workers formed a human chain to whisk gem-studded chalices and other priceless artefacts out of harm’s way. 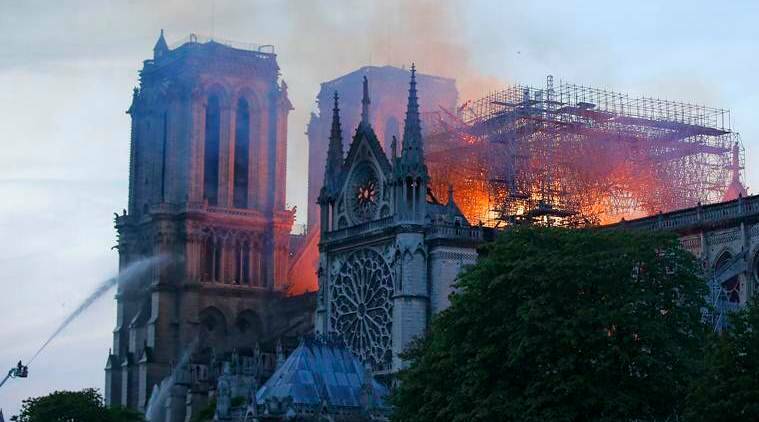 Notre-Dame’s famed stained-glass rose windows and most of its many religious relics appeared to have escaped the worst of Monday’s inferno as well, easing fears for the fate of the vast trove of artworks in the 800-year-old gothic cathedral. “We have avoided a complete disaster. But some five to 10 percent of the artwork has probably been destroyed, we have to face up to that,” Cumunel said. Four of the largest-scale 17th and 18th century paintings depicting scenes from the lives of the apostles had been damaged, at least in part, he added. Culture Minister Franck Riester said the paintings were mainly affected by smoke damage, rather than by flames. It remained unclear how well the cathedral’s towering master organ, embedded into a sculpted wooden casing, had fared, as rescuers remained on high alert for the possibility that some of Notre-Dame’s fragile vaults might come crashing down. The organ – which survived the French Revolution in the late 18th century, when it was used for recitals of patriotic songs – may have been slightly damaged too, according to Cumunel, though city hall officials said it was largely intact.